I like the idea of courses providing in their closure, a suggestion of WHAT’S NEXT? Since the theme underlying visual literacy was “your online professional identity,” my next-step suggestion is the book Business Model You. I’m using it to work through some ideas around THURSDAY as well as an even bigger idea than THURSDAY. I posted this book title on Tracey’s blog, as it relates directly to the customer-orientation she’s interesting in fostering in her responsibilities in Graduate Education, a support unit here at WVU. 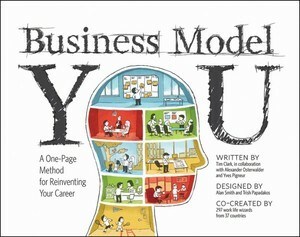 What the book is about is getting you to think about your “business model.” Every business has one – people may not be aware of it. It’s basically about (a) who is your customer? and (b) what do they need?” Note how this connects with what I said on the TED Talk Summary. I find that the book could be a jumping off point from this course directly to your career, future directions. After all, your future is based largely on the decisions you make. Keep going! This looks very interesting! I am going to check it out this summer!